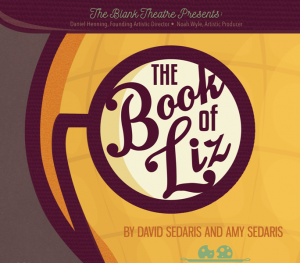 Coeurage Theatre Company (Jeremy Lelliott, Artistic Director; Nicole Monet, Managing Director), LA’s only Pay What You Want company, has announced a Gala Evening to raise funds for its upcoming production of Failure: A Love Story by Philip Dawkins. The event begins at 7pm on Sunday, July 5 at the famed Formosa Cafe in West Hollywood. Libations, music, prizes, and Independence Day weekend partygoers will abound. The evening will include live music by Ovation Award-winning company member Gregory Nabours and a silent auction and raffle featuring exciting items as complimentary passes to The Magic Castle, restaurant gift cards, accessories by Coach, fine liquors, free acting classes, and “renting” members of Coeurage Theatre Company to perform various tasks around the house, carpentry, cooking, and even creating your own short film. 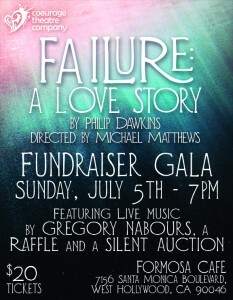 The upcoming Coeurage production of Failure: A Love Story by Philip Dawkins, directed by Michael Matthews, is set to open on Friday, July 24 at 8pm at GTC Burbank. Failure is a touching, whimsical tale that explores the impermanence of life and the permanence of love. Admission to the Coeurage Theatre Company Fundraising Gala is $20 and tickets may be purchased online at www.coeurage.org/tickets or by calling (323) 944-2165. The Formosa Cafe is located at 7156 Santa Monica Boulevard in West Hollywood, 90046. 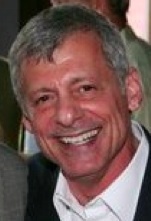 Tax deductible donations may also be made online at http://www.coeurage.org/donate/.